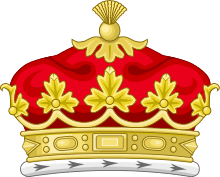 The title Duke of Lennox has been created several times in the Peerage of Scotland, for Clan Stewart of Darnley. The Dukedom, named for the district of Lennox in Stirling, was first created in 1581, and had formerly been the Earldom of Lennox. The second Duke was made Duke of Richmond; at his death, the dukedom of Richmond became extinct. The fourth Duke of Lennox was also created Duke of Richmond; at the death of the sixth Duke, both the dukedoms became extinct. The Dukedom of Richmond and one month later that of Lennox were created in 1675 for Charles Lennox, an illegitimate son of Charles II. The Duke of Richmond and Lennox was created Duke of Gordon in 1876. Thus, the Duke holds four dukedoms (including Aubigny-sur-Nère), more than any other person in the realm.